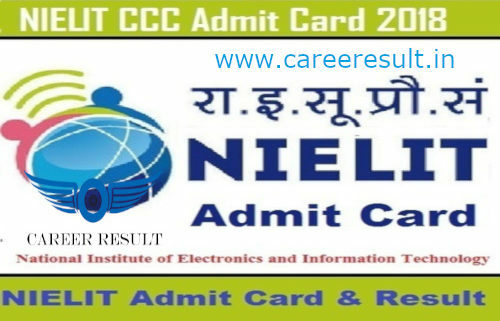 Instructions for Downloading the NIELIT CCC Admit Card 2018 :1. The candidates will have to open the official website of Online Student Information and Enrollment System in order to download the admit card. 2. The candidates will be able to view a section named on the right side of the home page. Once the candidates will click on it, they will be able to view the courses and programmer name. The candidates will have to click on Course on Computer Concept in order to download the admit card. 3. After clicking on the above mentioned link, the candidates will get the direct link for downloading the Admit Card. 4. Here, the candidate will have to enter the EXAMINATION NAME/APPLICATION NUMBER and DATE OF BIRTH (DD-MM-YYYY) and then click on ‘View’. 5. After submitting all the detail, the candidate will be able to download the Admit Card. Conclusion : For more detailed info regarding to NIELIT CCC Admit Card 2018 kindly visit official website and read carefully employment advertisement before applying against to NIELIT CCC Exam 2018. Subscribe Careerresult to get latest updates about NIELIT CCC Admit Card 2018 on your smartphone via E-mail. For more latest updates Admit Cards in Stay connected with us.All candidates have to request is to share this job link with your friends over at Whats App, Facebook ,Twitter,Instagram and help them get good career in your life.